As healthcare architects, we provide services that are already highly specialized. This focus is especially refined when we design to accommodate the needs of specific branches of medicine. Orthopedics is the field of surgery regarding the musculoskeletal system. Through our work for Orthopedic Associates, Health Facilities Group has met design standards that ensure OA continues to provide the finest of medical services. But HFG's specializations extend beyond technical medical needs. Through years of experience, we have cultivated a robust understanding of architectural style and its significance as a marketing tool. 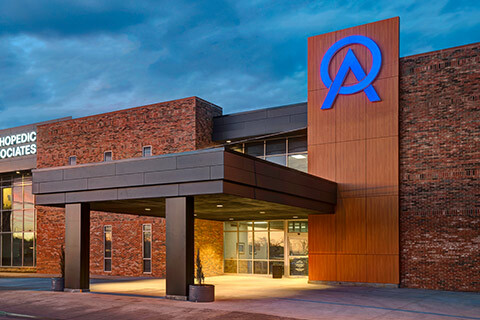 To maximize Orthopedic Associates’ publicity from its prominent location near a major highway, several branding elements are highlighted by our structure's striking and unique architectural language. By uniting technical competence with aesthetic command, HFG affirms its status as a thought leader in healthcare architecture. Health Facilities Group strives to provide superior services such that partnerships develop into lasting relationships. HFG has worked with Orthopedic Associates on 18,500 SF of work through multiple projects including upgrades to existing clinical space, upgrades to surgical areas, and design work for a new freestanding Ambulatory Surgical Center. This new ASC is designed to accommodate six operating rooms, a self-contained sterile processing department, and pre- and post-operative support spaces. Today, HFG’s partnership with Orthopedic Associates continues through a study of necessary upgrades to existing spaces, a new facade at the existing structure, and future renovations throughout the facility. Health Facilities Group has found that trust and fulfilled commitments lead to healthy relationships and recurring business.